Cloud inventory restrictions, rising house prices, and stagnant wages is forcing homebuyers to substitute downward in quality if they want to buy a house. For the last three years, house prices have gone up in price, but the incomes of most buyers has not. This simple fact forces buyers to make a choice: either get a lesser quality house, or keep renting. The decision to get a lesser quality house is the downward substitution effect. Not everyone will make the choice to substitute downward in quality, particularly if they can rent a nicer house for the same money. Since not everyone is willing to accept less just to own, as prices keep rising faster than wages, sales volumes weaken, which explains much of why 2014 disappointed optimistic housing bulls. Most people who discuss real estate demand don’t understand the nuances of what comprises it. Demand for housing comes in two forms: the quantity of demand (how many people are ready, willing, and able to buy), and the quality of demand (how much can those that want to buy put toward the purchase). The confusion between these two is apparent in the competing political narratives used to explain the housing bubble. The political right contends that increasing the quantity of demand by lowering lending standards created the housing bubble. This meme is politically convenient, but it’s also completely wrong. Let’s assume for a moment all qualification standards were eliminated and anyone who wanted to borrow money could get a loan, similar to what happened in 2004 through 2006. Would this cause a housing bubble? In my opinion, it would not. It would inflate prices, and it would cause a great deal of downward substitution of quality to get a property, but it wouldn’t necessarily create a housing bubble as long as loans were based on verifiable income and reasonable debt-to-income ratios on conventionally amortizing mortgages. In today’s housing market, there is no loan program available that can inflate house prices in an unstable way. The loose lending standards of 2004-2006 allowed many people to buy homes, but it was the combination of liar loans, unlimited debt-to-income ratios, and negatively amortizing loans that allowed the army of borrowers to finance loan balances double what they should have been. Increasing the number of borrowers can inflate prices through the substitution effect, but increasing the total amount buyers can put toward housing is what sends prices orbital. Toxic loan programs like the option ARM were not invented during the housing bubble; they were long-standing niche products with a hefty price tag to properly price the risk of default. It was the gross mispricing of risk on Wall Street that created an insatiable demand for these products that drove the price down and put these weapons of financial destruction in the hands of unqualified borrowers. Prices wouldn’t have inflated nearly so much during the housing bubble if the risk hadn’t been mispriced through ruinous credit default swaps and collateralized debt obligations given AAA ratings by a corrupted rating system. It’s right to be concerned about the return of some dangerous loan products. I expressed my belief that the new mortgage regulations will prevent future housing bubbles because the “Ability to Repay” rules will prevent reckless lending, but I could be wrong. These toxic loan products don’t conform to the new mortgage regulations, so right now they are very expensive and uncommon. We must hope it stays that way. Conditions are not ripe on Wall Street for facilitating another housing bubble, and with the secondary mortgage market still in turmoil, a dramatic increase in the amount borrowers can finance — the least stable and most dangerous inflater of house prices — isn’t going to happen. Therefore, the housing market can only inflate prices based on the willingness of homebuyers to substitute down in quality. Since house prices are near rental parity, since kool-aid intoxication is tempered by fear of a price crash, and since housing faces the headwind of rising mortgage rates, many potential homebuyers will not chose to overpay for a house just to become a homeowner: that form of kool-aid intoxication died with the deflation of the housing bubble. Call the cops! This house is for sale…huh? The competition in today’s housing market is suddenly fierce, so fierce that some are calling the cops. At a Saturday open house at her listing in suburban Belmont, she had over 100 people in 45 minutes, which blocked the street. Neighbors called police, who shut down the open house. Then Luther smartly hired an off-duty officer to direct traffic the next day for the Sunday open house. The officer counted more than 150 cars. The three-bedroom colonial house went under contract three days later with more than a dozen bids. In the post Did the OC housing market come alive in February 2015?, Shevy noted that the same is true in OC. If a property is priced at levels buyers can actually finance, it draws competing bids; however, if a property is priced beyond what buyers can finance without significant downward substitution in quality, it just sits there, often for a very long time. In the post How restricted for-sale housing inventory saps demand, I outlined the connection between the forced price increases in for-sale houses and rents is caused by cloud inventory. The biggest problem this creates is a long-term drag on housing demand because renters are unable to save for a down payment. When any commodity is in short supply, prices tend to rise; houses are no exception. Beginning in the 1970s, California produced more high paying jobs than it did houses. As a result, there were not enough houses to go around, so people began substituting down in quality to obtain a place to live. This downward substitution effect lifts house prices at every level of the housing ladder and prices out the lowest tier of the housing market. This phenomenon has been going on for so long, that most Californians resign themselves to the idea of living in lesser quality housing than they could obtain elsewhere based on their income. Since cloud inventory, the artificial restriction of supply engineered by lenders, is a nationwide phenomenon, the rest of the US is experiencing what Californians have endured for the last 40 years. “We’re afraid that interest rates are going to creep up, and inventory is down, so there’s more of a fear of loss right now in the market and people are coming out, Maria Rini, a real estate agent with Re/Max in Bergen County, New Jersey. Kool aid served up by realtors will always victimize the ignorant. For now, Farag and his wife will move in with his mother while they continue to search. The bottom line is that house hunters for the next several years will face the difficult decision of whether or not too keep renting or substitute downward in quality to own a house. Without kool aid intoxication to motivate foolish buying, it will likely cause resale volumes to remain low with bidding wars on well-priced properties and an MLS flooded with cloud inventory that won’t sell because it’s priced too high. Are you saying that there is NOT a large Chinese demand for physical gold? If not, what are you saying? Are you agreeing that there is NOT a large Chinese demand for physical gold? I’m suggesting that whatever demand exists for gold anywhere, it hasn’t stopped the price of gold from falling. The demand for gold in Europe is probably less than zero right now. Anyone who lives in the Eurozone can earn a return by holding currency since bonds have a negative yield. Euros as currency are more valuable than gold. Really? The price of gold in Euros is up in the last 30 days, 6 months, and 1 year. It is possible that the price of gold in Euros could rise if, “The demand for gold in Europe is probably less than zero right now”, but it would not seem likely. When the European central bank announced they were going to print money to generate inflation, the price went up. So what do you think will happen when they fail to deliver on that inflation? Right now, Europe is in the grip of deflation, and if the Greeks default, that deflation will get worse. BTW, gold priced in US Dollars is about to break down to a 5-year low. Don’t know. Haven’t thought about it. I had to look up European gold demand and found that you were wrong in your assessment. It appears that not only do Europeans value gold, in contradiction to your observation on prices, but there is also strong demand, contrary to your observation on demand for gold in Europe. Do you agree that Mellow Ruse’s statement is a sarcastic and funny way to say that there is NOT plenty of Chinese demand for physical gold? That is the way I read it. And I read your “LOL” as acknowledging his wit and insight on Chinese gold demand. Gold has not had a buy signal for 2.5 years. Everything has its day, but gold will have to hit multi decades lows to bottom and come back. But capital flows in gold are a rather small market compared to stocks, RE etc. I gave absolutely no thought to the propositional content of Mello Ruse’s statement. My LOL was an acknowledgement of the humor in Mello Ruse’s statement because he was poking the bear — or in this case the gold bull. In fact, I rather doubt Mello Ruse has an opinion on whether or not Chinese demand gold or not. I believe he was merely poking at gold bulls for the joy of doing so. I also believe he will get a big laugh out of this entire thread. If that is the case, then it is probably useless for me to respond to his or your comments. “I’m suggesting that whatever demand exists for gold anywhere, it hasn’t stopped the price of gold from falling. The first of my two points was not wrong as gold is making new lows in US dollars. The second of my two points was wrong in as much as gold recently had a minor bear rally in Euros. For the record, I contend gold will make new lows in Euros as well, probably within the next six months. Your previous comment that “it is probably useless for me to respond to his or your comments.” is certainly true when it comes to discussions about gold because neither of us care much or know much about gold, and your reactions to our comments merely amuse us. Perhaps you need to ask yourself why you invest so much energy defending your mental position about gold. Let’s assume for a moment that you are right and Mellow Ruse and I are wrong, and despite the 5-year lows in gold, it is the best investment and wealth storage medium of all time. So what? If you were comfortable with your contrarian position, like I was investing in Las Vegas real estate in 2010, then you would be unmoved by short or medium term price declines, and you would interpret negative sentiment on the asset class as a sign confirming your belief in it. Do you still believe in gold as investment or a store of wealth? If so, you shouldn’t be upset by 5-year lows in gold. If not, why do you need to convince us otherwise? Your were wrong both about the price and the demand. It turns out that demand for gold exists in Europe the area of your choosing, and the price has risen, not just a minor bear rally, but for 30 days, 6 months, and 1 year. And you did not say it will make new lows or in six months. You said NOW, to quote, “RIGHT NOW.” And there is your statement, “Euros as currency are more valuable than gold.” Obviously not to Europeans. You were wrong on all points and on all counts. And when shown how wrong you are, you changed your story. First deflecting to the price of gold in dollars, which neither I nor MR said anything about, and then later to how you were just joking, paraphrasing. And now to how gold will behave in the future in Euros. And something about me defending my mental position on gold, rather than admitting you were wrong. You were right that neither of you know much about gold, but I doubt that MR will agree with you on that. You are creating a straw man. I have neither defended gold as an investment, nor my mental position on it. I HAVE been pointing out how wrong MR is when he comments on gold, and I do enjoy that. You can analyze my motives all you want, but it is as simple as that. And today he chooses not to back up his statement. Because he is wrong. That’s all. I enjoy pointing out that he is wrong. So now, you are an expert on what the signs that someone is comfortable with his or her positions on gold or real estate or anything else? I will come to you next time to find out how I should feel about my positions since you seem to know about me than myself. I do not believe in gold as anything. It is a metal, not a thought process, an idea, or a religion. Gold is a store of wealth. It is not an investment. Bottom line, gold is money. It is not a belief. It is a historic and present fact. When did I say anything about 5 year lows in gold? When did I say I was upset? Or is this more of your divination process? Do you think that if someone points out that you are wrong, they are trying to convince you of something? Quite the ego you have there. I have no illusions or desire to convince you of anything? I do not even know what I would convince you of. That gold is an investment. Not. That gold is a store of wealth. It is, no matter what you think. Your perception of it is as relevant as my perception of it. Go back and read my posts from the perspective that I enjoy pointing out how wrong MR is on his knowledge of gold. Although most real estate markets have rebounded from their recession lows, this harsh fact remains: About 7 million homeowners continue to be stuck in the tar pit of serious negative equity, with mortgage debt at least 25% higher than the value of their property, according to research firm RealtyTrac. Many of these owners are also hurting financially. They are behind on mortgage payments, often in negotiations with their lenders on ways to modify their loan terms, write off a portion of their debt or do a short sale — selling the house for less than the mortgage amount owed to a new buyer, with the lender forgiving the unpaid balance. Improvements in housing prices have largely bypassed these folks, as has the overall economic recovery in the last several years. All of which underlines the significance of a legislative effort now getting underway in Congress to spare these people from punitive federal taxes on any amounts forgiven. Wait a minute, you might ask: Didn’t Congress extend the Mortgage Forgiveness Debt Relief Act last year, which was designed to ease the burden on troubled owners with negative equity? Yes, it did — but only for people who received write-offs during 2014. The debt forgiveness law expired at the end of December and is now dead. Owners who are currently negotiating or planning loan modifications or short sales involving cancellation of portions of what they owe in 2015 have no legal protection against big tax bills next year. Under the federal tax code, if a lender forgives mortgage debt as part of a loan modification or other arrangement, that amount will be treated by the IRS as ordinary income and taxed accordingly. Typically the tax bill runs into the tens of thousands of dollars. Depressing mortgage lending part of the plan? The combination of low mortgage rates and strong jobs growth continues to do little to spur purchase mortgage demand: the latest MBA purchase application reading of 173 is comparable to 1995-1996 levels, when the economy was less than half its current size. The repressed lending activity on what is for most Americans the biggest ticket purchase they will make shows that credit creation and money velocity remain depressed. Bank of American/Merrill Lynch analyst Chris Flanagan says this is a feature, not a bug. “As we have written many times, whether it was recognized or not, weak mortgage credit creation effectively was the ‘plan’ when the post-crisis regulatory and capitalization framework was implemented,” he says. First-time homebuyers are poise to make a comeback with the potential for Millennials to flee the nest and enter the housing market on their own. According to Diane Swonk, chief economist at Mesirow Financial, “the Great Recession delayed, but did not destroy, dreams of home ownership.” Now, increased job growth, a return of non-bank lenders to the mortgage market, and the expansion of low down payment options should prompt more buyers to enter the market, according to Swonk. According to the report, housing starts are expected to rise at a double-digit pace to 1.14 million, the first year above the 1 million unit mark since 2007. Single family starts are expected to show new signs of life. Home sales are expected to rise a moderate 3 percent to 5.7 million. Home prices are expected to rise between 6.5 percent and 7.5 percent depending on the measure. This marks acceleration over the pace of appreciation in 2014 and reflects the tight inventories, says Swonk. Tight inventories and a pickup in demand suggest home values will rise faster in 2015. The housing market is beginning to pick up because of several factors. Entry level pay for new college graduates is expected to rise, mortgage rates are remaining low, and confidence in the economy has surged. Not to mention, credit conditions are expected to ease, with non-bank mortgage lenders trying to target first-time homebuyers by providing them with low down payment options. However, student loan debt continues to weigh down young borrowers. Those who have defaulted outright are locked out of the housing market, while those who reconstruct their student loans are doing better. Swock says she knew of one young woman who qualified for a $300,000 loan after restructuring her school debt. The U.S. Department of Housing and Urban Development (HUD) announced that nearly 50 percent of the 79,029 single-family residential loans sold through its Single-Family Loan Sale (SFLS) Program have been resolved and are no longer non-performing, according to the Department’s update on its SFLS Program released on Friday. The majority of those loans sold, about 97 percent, were sold through HUD’s Distressed Asset Stabilization Program (DASP), which began in 2012. HUD has conducted 13 distressed loan sales since beginning the SFLS program in 2010, seven of which have been conducted since DASP began in 2012. About 75,ooo loans have been sold as part of DASP in regional or national pools, totaling more than $12.6 billion in unpaid balance, according to HUD’s report. Since HUD began SFLS in 2010, it has resolved 38,385 out of the slightly more than 79,000 non-performing loans through various means as of February 2015, a total of 49 percent. Out of those resolved loans, 16,706 of the borrowers (21 percent of the non-performing total and 43.5 percent of the resolved loans) avoided foreclosure through either paying the loans current, forbearance agreements, paying the loan in full, a short sale, a third-party sale, or a deed-in-lieu of foreclosure. The most common resolution for delinquent HUD loans in the SLFS Program was borrowers bringing the loan up to re-performing status through timely payments, with 6,249. About 20 percent, or 16,031, of the non-performing loans were resolved through foreclosure, and 254 of the properties were held for rental. Nearly 7 percent (5,394) were resolved through whole loan sales. In addition to the national and regional pools, HUD has sold 20,784 non-performing loans as part of its Neighborhood Stabilization Outcome (NSO) program, which was introduced at the same time as DASP in 2012 in order to target more specific areas. The NSO program has resulted in six sales of distressed loans totaling about 3.7 billion in unpaid balance. HUD has sold 98,007 distressed loans for a total of approximately $16.7 billion in unpaid balance when NSO loan saies are combined with national and regional loan sales. According to HUD, the Department began DASP sales in 2012 as part of a “broader effort to reduce losses and increase recoveries to the Mutual Mortgage Insurance Fund,” which is currently at 0.41 percent, less than a quarter of its required level of 2 percent. Have Big Homes Topped Out? The real estate market has slowed during the past year, a remarkable achievement given interest rates below 4 percent, prices nationwide which have yet to return the 2007 peak, and as much pent-up demand as anyone can imagine. Not only does the real estate market remain fragile, the new-home market in particular has not come close to regaining its past allure. The advantages of new homes — modern technologies, new warranties, new appliances, and the ability to select models, colors and features — have simply been overwhelmed by costs. In 2005 there were 1.283 million single-family new home sold but only 437,000 sales in 2014 while existing home sales went from 7.040 million in 2005 to 4.940 million in 2014. In the case of both new and existing home sales there has been a huge contraction. Existing home sales are down 30 percent while new home activity dropped 63 percent. The sale levels seen in 2005 are unlikely to be repeated for a very long time in large measure because many transactions back then were lubricated with toxic financing, loans which in fairly short order lead to a massive number of foreclosures and short sales. That said, new home sales have fallen a lot further than existing home transactions. Why? In large measure because of problems relating to price and size. Compared to the price of the land, buying a slightly larger house is a good value. When two-thirds of the sale price is land value, doubling the size of the house only adds 33% to sale price. Let’s say a 1500sf house costs $600k, of which $400k is land value. At $125/sf construction cost, you are looking at 125*1500=187.5k to double the size of the house. If you are topped out at $600k, then it doesn’t matter how good a deal the extra square feet is — you can’t afford what you can’t afford. But if you can afford a little more, why not? It’s a good deal. Sure, I could get by with a Honda Civic. It has four doors, an engine, brakes, a/c, etc. But I really think a minivan is a better fit for a family of four. It’s my money, and I’ll spend it how I damn well please. There is a spectrum of new/used cars to fit any budget, why should home sales be any different? I’m not sure why people keep referring to 2005-7 price and sales levels to show that current prices are too high and sales are too low. When did mass hysteria become the benchmark? Whenever I see these years mentioned in an article, I know the author has an agenda. When I also see the mid-90s trough mentioned in the same article I know the author is trying to manipulate the data and press emotional buttons. Extreme views are only supported by outlier data points, I suppose. The real problem in California is the weather. It’s just too nice. Everyone wants to live here, but there simply aren’t enough resources to allow that to happen. So, traditionally, the way resources are allocated is by price. Prices rise based on real demand. If they didn’t, we would have 7 billion people living in Southern California — until all the water was gone in a few weeks. As time goes on, in any rational universe, the housing scarcity should get worse, not better. Homes appear to be more affordable at times as all the pretenders get washed out by cheap credit. But all this does is pull sales forward, and encumbers real buyers with excessive debts. This increases the time between move-up/on sales and decreases sales overall. Be careful going down that line of reasoning. The weather is fantastic in Tijuana, but everyone doesn’t want to live there. Although, not everyone wants to live in Santa Ana either, but they do – in large numbers. If you could find a similarly crime-infested and poverty-stricken locale, where the weather was much worse, you might find that Tijuana looks pretty good (I’m not sure such a place exists, so it might be hard to make a direct comparison. Russia maybe?). My point was that California is desirable for a number of reasons: chiefly, but not exclusively, the weather. High property prices are the result. Another big part of the reason for high house prices is the restricted inventory. House prices would be higher here than the rest of the country because wages are generally higher, but our house prices are an order of magnitude higher because people are forced to compete for housing and substitute downward excessively. I did a post back in 2007 comparing Irvine to Minnetonka, Minnesota. The household incomes are the same, but house prices in Irvine were 2.5 times higher. Kool aid intoxication from the bubble explains some of it, but the competition for scarce resources explains some of it too. btw, will Calif be desireable in good weather but during a megadrought/massive water rationing conditions for over a decade+? Home buyers are becoming increasingly interested in properties with smart-home features, and more of these types of homes are coming onto the market. But most real-estate agents don’t think sellers should add such features before listing their homes, and few think they make homes sell faster. That’s according to a survey of 513 Coldwell Banker real-estate agents in the U.S., who were quizzed on the topic between January and February of 2015. For whatever reason, however, a Coldwell Banker press release spins this survey in the exact opposite direction. “Smart homes sell faster,” it reads. “One in three (33 percent) noted that homes with smart home features and technology sell faster than homes without them.” That’s true, but the survey results indicate that 41 percent of Coldwell Banker’s agents do not think smart homes sell faster, and 27 percent weren’t sure. Buyers expressed the most interest in security features, such as door locks and video cameras. Smart thermostats were the next most popular item, followed by safety systems such as fire alarms and smoke detectors. Interest in lighting controls came next, with entertainment systems following close behind. The story behind the story: The good news for people selling smart homes is that more people are interested in buying them. But there’s one critical question this survey doesn’t answer, at least not straight out: Will a smart home command a premium over a similar home that doesn’t have connected features? The fact that 51 percent of the agents surveyed don’t think home sellers should add connected-home features to their properties before they list them, and 41 percent don’t think connected homes sell any faster than ordinary ones leads me to believe the answer to that question is no. I suspect buyers will expect those features to come as part of the package, or they’ll decide to install their own systems after the sale. If you’re contemplating installing a system in your home, don’t bank on recouping your investment when you sell. The convenience, safety, and security features might be the only reward you get. House hunters will be sacrificing much more than just “quality” buying a house in ’15. 1) investment 101: buy low, sell high. 2) the world is in the ‘financialization’ end cycle. I’ve been pondering the future of financialization recently. Do you really believe this won’t come back? I tend to think Wall Street never forgets an idea that once made them money — even the bad ones that blow up in their faces usually get reincarnated in a new form. I should add that chart to my post on why I don’t believe the federal reserve will raise interest rates this year. The lower the velocity of money, the less pressure there is on prices. Holding and hording currency is a feature of deflation, and a good measure of that behavior is the velocity of money. 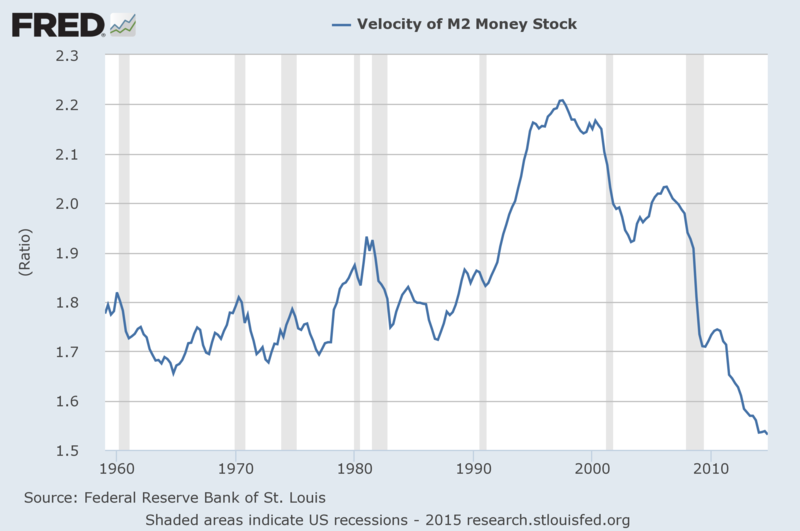 I can’t see the federal reserve raising rates until the velocity of money increases. Au contraire, the fed is going to raise rates this year…. just look at the MSM narrative put out to the sheep since QE ended; ie., the economy is pretty good/expanding, unemployment rate is lower/recovered, wages have stabilized/increasing in some cases, gas prices are down, median(lol)home price is up and so-on. Do you think they are laying the groundwork for an increase? I still believe they will leave rates alone. Until inflation forces them to raise rates, I don’t think they will. A few points worth making. Inventory is very low. In the name of helping the middle class, the Obama administration attempted to manipulate home prices lower by clamping down on mortgage availability. However, all this did was restrict supply. Homeowners are unwilling to sell at these manipulated price levels. This article incorrectly makes the point that these homeowners are not selling because they are underwater. So, no supply, and the supply will only return when the next administration allows mortgage laws to return to normal levels which will allow prices to rise. Also, the middle class is being badly hurt as they watch move up home prices run upward since the Obama mortgage restrictions did not hit prime markets. So, the gap between mid markets and prime markets continue to widen which hurts the middle class. Plus, the argument that wages are stuck low is contradicted by recent IRS tax receipts at record levels. Record tax recepits equal higher wages. There are no mortgage restrictions. The banks can make whatever loans they wish they just cannot place all the risk onto the back of the tax payers by selling the securities to the GSEs. The financial sector has to dismiss all the bad debt they created a decade ago. Thanks for your astute observation. I don’t believe the restricted supply is related to the more prudent lending standards in place today. The main reason we don’t have more supply is because many borrowers are still underwater. Your statement that this isn’t so is not supported by any facts or causal mechanism. I agree with you that supply will return when house prices rise, but only once prices rise high enough that underwater borrowers are no longer underwater. The next administration is not likely to work to lower lending standards, unless perhaps Elisabeth Warren wins, but she will be fiercely opposed by Congressional Republicans who want to protect the US taxpayer from exposure to the inevitable bailout that will follow any significant relaxation of lending standards. Tax receipts are a combination of the number of workers times the taxable income of these workers. Tax receipts can rise in the absence of rising wages by increasing the number of workers, which is what’s been happening over the last several years. Who will be able to afford the increased inventory that will come after the price raises? The younger generation has no hope of sustaining these already inflated home prices. It seems that only the boomer generation that got in at lower prices and enjoyed decades of inflation beating appreciation (in California) and wealthy foreigners are able to play in the game. Their children are left out in the cold. Eventually the boomers will downsize or pass away and there will be very few who can pickup the pieces and keep the game going. Many boomers I know are heloc’d out their a$& just when they are about to retire. With interest rates at bottom levels and wages stagnant where will the source of future appreciation come from? The Ponzi scheme will eventually run out of new applicants who are willing to risk it all. The problem you described is one of the main reasons I believe we will see an extended period of inflation at some point. Without pay raises, which have been rare over the last decade, future generations will not be able to afford peak prices even at 3% mortgage rates. Something has to give, and allowing some inflation is the path of least resistance. That would require wage inflation to outstrip home price appreciation. Something does indeed have to give. Medical, college, and home prices have all beaten inflation by a good amount. Not much disposable income left around for saving for down payments or the high home prices. Add in high costs of child care and the young families are pretty well screwed (both parents have to work to afford these prices). As someone already stated the media referring to home prices not yet back to 2006 peak levels as a statement the housing market has yet to recover is ignoring logic. The only reason they ever reached that high is due to the crazy lending/speculating of those days. The prices as we all know we’re not based on fundamentals but somehow that is now the benchmark. Throw in the fact that median wages are now lower than back then and the liar loans and fancy financing is largely no longer available and you have the majority of Californians who can’t afford homes without risking financial suicide. The housing bubble and its aftermath as you have written about will be rearing its ugly head for a long time. It’s very frustrating. According to this article the wages increasing doesn’t look likely. This is what happens when a favored industry with enormous political clout (home-building + home selling + home financing) uses that clout to prop up the value of an asset. The flip side of the coin is that the “American dream of home ownership” gets that much more out of reach for many people. The housing industry gets preferential treatment, which helps those who have it, but distorts he market enormously. Builder confidence in the market for newly built, single-family homes in March fell two points to a level of 53 on the National Association of Home Builders/Wells Fargo Housing Market Index released today. There’s no doubt that the year is off to a bad start for housing in terms of housing starts, completions and permits. Existing home sales tumbled in January, and mortgage applications have been spiraling downward in February, giving away most of the gains made in January. “Even with this slight slip, the HMI remains in positive territory and we expect the market to improve as we enter the spring buying season,” said NAHB Chairman Tom Woods, a home builder from Blue Springs, Mo. Nela Richardson, chief economist for Redfin, had a different take. There is always sacrifice when buying a house. If you’re pushing your DTIs to the max to get the “most house” possible, you’re sacrificing your future income and financial security. If you choose to keep your DTI closer to 20 than 30, you’re sacrificing your ability to buy a nicer house. If you’re married, you’re making even more sacrifices because you’re not the only decision maker. The biggest sacrifice we’ll be making when we buy, is likely a decent yard. The development we’re interest in we’ll result in a 17′ deep back yard – not much to work with, but at least it’s not just a walkway. A yard is the most common sacrifice in Irvine. In fact, the entire Irvine Company method of obtaining maximum value on its land is to provide great neighborhood amenities in exchange for a back yard. By providing large collective recreation areas, they can dispense with the large private ones behind the house. They save much more land by eliminating back yards than they give up by providing parks, so they end up selling their land for more money. You can see this very clearly in the land plan for Woodbury. Very few houses have yards, and even the $1M+ houses have small ones, but the parks are large and numerous, particularly the main park in the center. Overall density at Woodbury is higher than previous developments with this design. I dont know if you remember, but since beginning of Feb Ive been saying that demand seems to be sky rocketing. Now that this has been confirmed, I am now seeing demand softening again here towards the mid/end of march (albeit not by much. Have you seen any data on this? Any observations from Shevy in this regards? When I last spoke with him about this two weeks ago, he said the overall market has tipped from a marginal buyer’s market to a marginal seller’s market. He said the hype is overblown. Perhaps in specific neighborhoods the ebb and flow has been more pronounced, but by and large the market is still balanced. I will see him Thursday morning, and I will get an update.